Love this reading pillow. Supports my back in bed better than anything else. Whether you're completing work, transcribing the day's events in your personal journal or enjoying the latest bestselling novel, this reading wedge pillow keeps you comfortable. 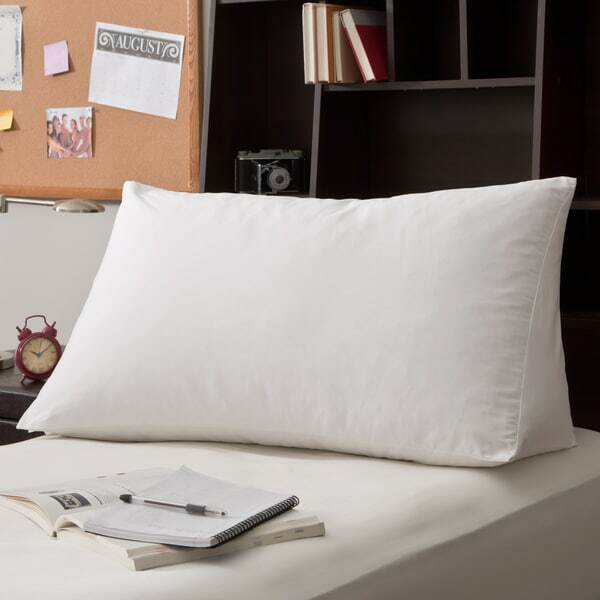 This down and feather pillow has a thread count of 230, so the surface is soft on your skin. The two-layer exterior surface of this down and feather pillow resists leaks to make cleaning and maintenance easier. This pillow was better than I had hoped. The ducking is very high-quality, and it's packed full of down/feathers. providing very good support. You can purchase covers at *** ******* ******. Search for "cotton twill pillow covers" and get the "large reading wedge" size. It fits almost perfectly. I ordered this because I was having problems sleeping on my shoulders. It is very nice for my king bed. Great goose down and not a lot of feathers. This is a fantastic, heavy goose down reading wedge, exactly what I wanted and had been looking for. The quality is perfection, and we love it! I bought one for my wife and one for my mother. Both of them say it is the most comfortable they have slept in a long time. The pillow is filled nicely with enough down and feathers to be absent of open spots with no fill. The temperature of the pillow is just fine no extra chill in the cold and no extra heat when it is hot. The price was great. The only thing I cannot report is how they will last over time. I actually sleep on this pillow. The angle is perfect for me as I am a side sleeper. It is not as firm looking as the picture. My biggest problem with this product is not having a covering for it and there not being a product available as a covering for it. Sometimes I get acid reflux, and having this wedge pillow has help me get relief and be and be able to fall back to sleep easier and well supported. I wish I could find a pillow cover for this wedge pillow!! Just keep your mind open. Upside down, this pillow is the perfect angle that doctors recommend to help,with sinus problems. It doesn't tumble down while you sleep! Works, I'm telling you. Oh, yeah, it's helpful,for reading in bed too. Had the pillow for about 3 months, hasn't lost its shape - it is fairly firm but as a reading pillow that is a good thing. Finding a pillowcase was challenging although Overstock is carrying them now. Wouldn't hesitate to purchase again. Bought this because of GERD, it is better than other support pillows I have tried. Wow! These pillows are so luxurious, and unbelievably comfortable. Love them! High quality, color is exact and fits perfectly within our room. The style is clean and it feels like it will last a long time. Highly recommended! I love it, no more stiff neck watching tv on the couch. Just enough angle to lean back comfortably. Bigger then it looked in picture. Got back on Overstock to order another pillow and case to go with it. My kids like them also for leaning on when playing games. Too firm for goose down. Not what I was expecting. Had surgery and needed to be elevated but comfortable. This wedge is perfect. Christmas present for son in law. "Where do you get a cover (pillow case) for this wedge pillow." Hi cherwoo, currently we do not carry a cover for this pillow. Thanks for shopping with us! Sherri R.
If you simply do an internet search for wedge pillow case cover with the exact dimensions listed: 18 inches high x 36 inches long x 12 inches deep, you will find a variety of options listed.